Two posts ago I discussed the bouncing droplets topic, but since that was part of an April Fools joke that maybe left a wrong impression on the topic. Today I want to present how quantum superposition contradicts the classical idea of a particle trajectory. For fun we will call our particle Waldo, and try to locate it along the path. What I will talk about today is based on the example given by Jean Bricmont's in his book Making Sense of Quantum Mechanics In turn this example is inspired by David Albert's book: Quantum Mechanics and Experience. As a disclaimer, Bohmian quantum mechanics does provide a location for "Waldo" but I will not discuss how in this post. However, as we will see, classical ideas are incompatible with the quantum effect of superposition. if an electron is sorted one way by a box, passing the same electron through another box of a different kind results in 50%-50% outcomes from the new box. What percentages do we obtain? Remember that the boxes are imaginary boundaries for the inhomegenous magnetic field and instead of using mirrors we can use the first setting and bring the boxes closer and closer by overlapping the magnetic fields inside until the two boxes become one. So the first picture would make us predict that when we have only one box we would get 25+25=50% z UP and 25+25=50% z DOWN, while in fact we get 100% z UP and 0% z DOWN. This quantum surprise has a name: quantum superposition. It is superposition which distinguishes quantum from classical mechanics. Now suppose we block one of the paths in the second picture (which illustrates a Mach-Zehnder interferometer) then by applying the second rule from above we would get 25% z UP, 25% zDOWN, and 50% lost by the barrier blocking the path. 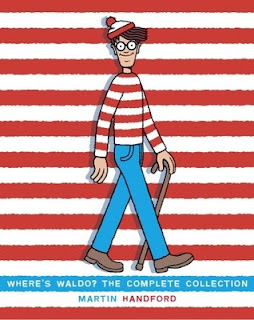 Does Waldo takes the upper branch path? No, because to make sure this is the path, we block the bottom branch path and this results in 50-50 split at the final Z Box, and the final result is all z UP. Does Waldo takes the lower branch path? No, because to make sure this is the path, we block the upper branch path and this results in 50-50 split at the final Z Box, and the final result is all z UP. Does Waldo takes both paths? No, we always find Waldo in one or the other path is we try to see where he is. Does Waldo takes no path? No, if both paths are blocked nothing is detected at the end. The trouble with this reasoning is counterfactual definiteness which is obeyed by classical mechanics. For example in the first two arguments above we assume that a the experiment would be the same if we would place a barrier in one of the paths and this would not change anything. In fact, quantum mechanics is contextual and the experimental setting plays a critical role into what it is measured. However, in classical physics we assume the existence of properties of objects even when they have not been measured and this is not the case in the quantum world. "The trouble with this reasoning is counterfactual definiteness which is obeyed by classical mechanics. For example in the first two arguments above we assume that a the experiment would be the same if we would place a barrier in one of the paths and this would not change anything." Introducing a barrier implies a change in the particle distribution for the experiment. That barrier is composed of some particles (mainly electrons and quarks). According to Maxwell's equations a change in charge density implies a change in the electric field in which the electron moves, so the trajectory of the electron changes. You keep repeating this fallacy, that classical physics is not contextual. Classical mechanics of the rigid body is indeed non-contextual but classical field theories, like electromagnetism and general relativity are. My above example (focused on the electric field) is just one possible implementation of contextuality in classical physics. In Couder's experiments (which are also based on a classical field) the information regarding the geometry of the experiment is available to the "particle", the oil drop, by means of the waves propagating in the medium (silicon oil). Again, this is clearly contextual. Adding a barrier changes the waves guiding the drop, therefore changing the trajectory the particle takes. Thank you for your comment. I will be extremely brief as I only have a few moments to answer, but please imagine this: the two arms of the interferomenter are so widely spaced such that no signal traveling at the speed of light requires more than a day to travel between the two arms. Is your argument still valid in this case? Why not? The field is infinite in range. Suppose the electron travels close to the speed of light, and the arms of the interferometer are 1 light-minute to the mirror, and another 1 light minute back. Moreover suppose the last picture in the text is very elongated vertically such that the distance between the mirrors is say 1.99 light minutes. I launch an electron in the device at t=0, and at t=58 sec (before the electron reaches any mirror) I block the down path with a barrier. If the electron is coming on the down path but it is still detected, it then has to turn around. If it cannot exceed the speed of light, it has to travel for about 3 minutes until it will reach the detector. However, if I repeat the experiment many times, the electron is detected 50% of the time at approximately t=120 sec. If you believe relativity is right and no physical object can travel faster than the speed of light, then what you observe is incompatible with "local realism". The second box with the x-up/down path reflected to the z-box will only give prob(z-up) = 1 if there is no measurement of which path the particle takes. In other words there is no detection of whether a particle is x-up or x-down. Even if you don't place the barrier at the beginning of the experiment you still need to include some mechanism to move it at a certain time, therefore changing the particle distribution of the initial state. This change implies a different field acting on the electron and consequently, a different trajectory. This is an inevitable consequence of the fact that classical electromagnetism is both contextual and deterministic. It is impossible to start two experiments with the same state (that would guarantee a similar trajectory of the electron) and reach different states (with or without barrier). Local realism is alive and well. I would also like to point out that realism is necessary implied by locality. As EPR has shown if the properties of the entangled particles are not determined before the measurement you need non-locality. The claim that a denial of realism can save locality is unsupported. Electric forces of attraction/repulsion die off as \(1/r^2\). What an ant does on Earth has no impact on the motion of a rover on Moon or on Mars. The motion of the ant and the rover is a function of the electric/magnetic fields at their location. Let the X coordinate to be along the line connecting the two objects. Let's include the charge density of the entire universe in our calculation. The electric field at the ant's location will be described by the same equation as the electric field at the rover's location with only a change in the X-coordinate (the distance between them). So, there is a strict mathematical relation between the seemingly unrelated evolution of the rover and the ant. However, this relation is not necessarily caused by the direct interaction between them (which can be very weak, indeed) but by their interaction with all the other objects in the universe.